Kidneys is the organ essential for all animate either human or animal. 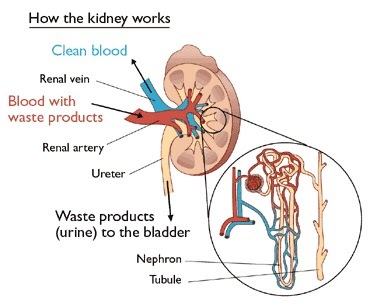 The main function of the kidneys is to excrete toxic waste found in our blood through the removal of urine. Kidneys need to function properly to guarantee perfect body health. Diseases such as diabetes, high blood pressure can damage the kidney if unable to get treatment from the doctor. Medication including traditional medicines without the advice of a doctor is also a cause of kidney failure. Food pollution such as pesticides can also cause kidney damage. If the kidneys fail to function properly will cause severe health problems. Thus, serious renal patients need to undergo dialysis for cleaning up blood from toxic substances that are dangerous. Dialysis machine serves as a substitute kidney. The blood that carries the toxic substances flowing through the renal artery into the kidney. 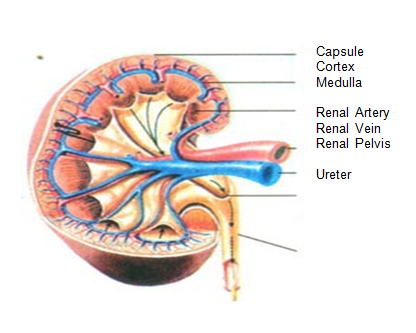 In the kidney, blood will be undergoing the filtration process. 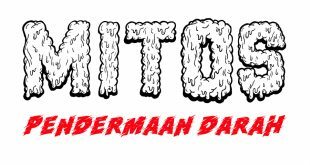 All toxic substances are filtered and eliminated through urine. The clean blood is will be out from the kidney through the renal vein and circulating back to the whole body. This process occurs throughout our lives. The doctor will be able to find out the status of the kidney by running procedures such as laboratory tests and testing radiation-X. Laboratory tests are usually done through a blood test and urine test. 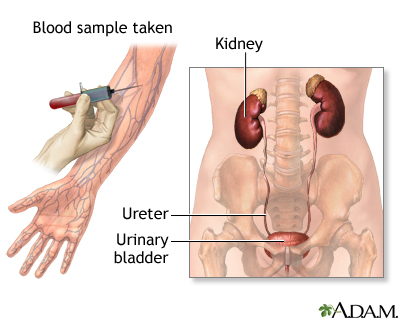 The most common blood tests involved were urea and creatinine testing. Urea is the waste products of the body as a result of protein metabolism. Creatinine are waste materials from the body as a result of muscle protein metabolism. 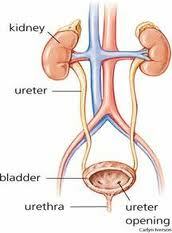 Urea and creatinine usually eliminated by the kidneys through urine. 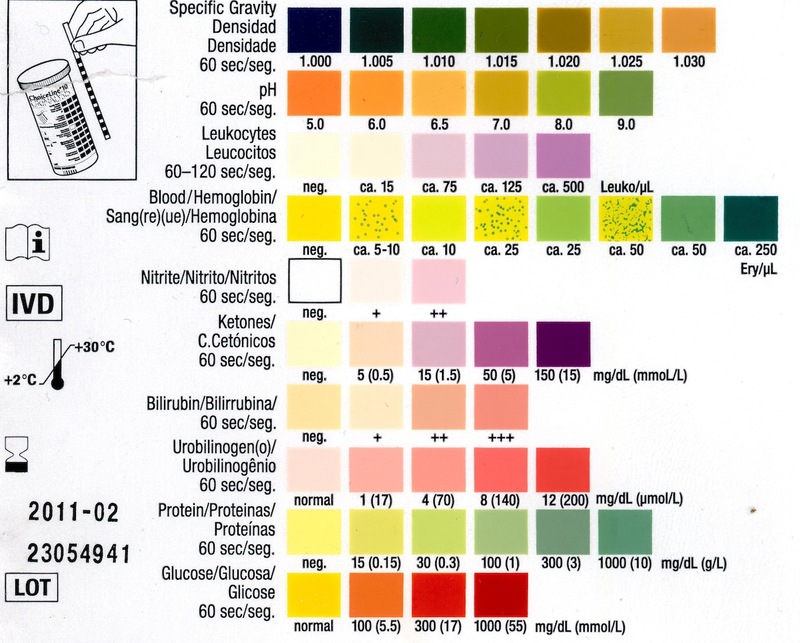 The concentration of urea and creatinine in the blood when excess normal range is to manifest renal function failure. The tests estimated glomerular filtration rate (e-GFR) is the test estimates the rate of renal glomerulus filtration. Kidney function is normal when our e-GFR within range 90 – 120 ml/minute. If our e-GFR less than 60 ml/minute, the possibility of kidney damage. The presence of red blood cells and protein in the urine may also be sign of kidney function problems. Some types of waste metabolic and medicine is toxic if excess normal range in the blood. Because of kidney function as an organ to get rid of toxic substances, that why the kidney testing often performed if the doctor wants to start a treatment to find out the effects of drug consumption by the patient can cause kidney damage. Intake of supplements such as multi-vitamin, mineral salts or traditional medicine excessively could possibly cause kidney failure. Therefore, we need to ask the advice of a physician before beginning any food intake or traditional medicines on an ongoing basis. Kidney is no tradeoffs. “Loved our Kidney” and be grateful .